When the government announced plans to build a wall along the border with Somalia, many received the news with mixed reactions. A cocktail of relief and excitement was evident on many faces because Al-Shabaab, a Somalia-based terror group, had killed and maimed many lives on Kenyan soil. The plan came after the Garissa University terror attack on April 2, 2015 that claimed 148 lives, majority of them students. The plan was to build a two-feet tall wall over a 400-kilometre stretch. It was to have designated immigration and custom entry points fitted with CCTV cameras. The wall was also to have two parallel concrete fences of heavy mesh and razor wires running in between them. 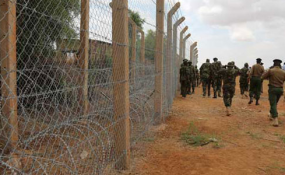 A three meter deep trench on the Kenyan side was to run along the fence, and next to it a road to be used by security personnel during patrol. Today, the project has since changed from a complicated wall construction to a mere wire fencing with Sh3.4 billion already gobbled up, according to a recent parliamentary report. Less than 30 kilometres of fencing has been done since 2015 when the National Youth Service personnel (NYS) was deployed to carry out the project. The NYS staff abandoned the works citing lack of payment by the government and immediately the Kenya Defence Forces (KDF) was engaged. Since 2015, both Kenyan and Somali nationals along the border have resisted the idea. They claim the project is a ploy by the Kenyan government to separate communities under the guise of fighting terrorism. "This wall is going to come with a lot of problems including dividing us when we have coexisted peacefully for years," Mr Ahmed Adan Issack told Sunday Nation. His sentiments echo the views of many locals in Mandera County and parts of Somalia living across the border. Somali nationals residing between Mandera and Somalia's Bulahawa town opposed the project and gave a raft of demands to be fulfilled by the Kenyan government before the project could take off. They demanded to be compensated for their houses that lie on the no-man's land. At least 64 houses had been marked for demolition. Unable to meet the demand, the government opted not to fence the contested area linking Mandera and Bulahawa; the area has remained open to date, allowing free movement of human and goods. No single structure has been demolished. "We were ready to fight just in case our houses were demolished without compensation and meeting of our demands by [the] Kenyan government," said a local with a home at the no-man's land who requested not to be named for security reasons. Those along the disputed area asked the government to accept those who have Kenyan identity cards to settle in Mandera. They also demanded to have their children learn freely in schools in Kenya. Residents on both sides of the border viewed the project as a disruption of business, social interactions and movement of livestock by herders in search of pasture. The government was forced to halt the project in March 2018 to deal with the issues raised by the communities. Through Mandera Governor Ali Roba and his Gedo region counterpart Mohamed A. Mohamed, both states promised to iron out "thorny issues" before proceeding with the project. Somalia had asked Kenya to consider the social interaction of the communities along the border before separating them using a wall. Mr Adan Sheikh, a businessman in Mandera, said that as long as the designated points are free from corruption then the business community has no problem with the wall. "We are making losses bribing officers manning the border but if things will be streamlined by the wall, then we don't have a problem," he said. Last month, the National Assembly asked investigators to look into how Sh3.4 billion was used to construct 10 kilometres only. While noting that a border wall is not a viable measure in the fight against terrorists, the MPs decried wastage of resources. The project has three phases -- the northern sector from Mandera- Elwak (160 kilometres), central sector from Elwak to Libat (445 kilometres) and southern sector from Libat- Kiunga (105 kilometres). All the three sections are being undertaken by local contractors under supervision of the KDF. The Mandera-Elwak stretch is divided into three phases under different contractors. One of the contractors was killed by an explosive while on site in August last year. In the 2015/16 financial year, Sh306 million was allocated for the construction of the wall and another Sh578.2 given in 2016/17, according to the parliamentary report.